Thirty-nine recruits have graduated from the Missouri State Highway Patrol academy in one of two classes held annually. Advancing troopers took part in a ceremony before a standing room crowd at the agency’s academy gym Friday in Jefferson City. After completing the academy, the starting salary for Missouri Highway Patrol Troopers is slightly over $41,000. A check of 15 trooper salaries throughout the state showed pay ranging from roughly $42,000-$48,000 as of November 30th. They also receive at least 15 vacation days and 11 paid holidays per year. Not all recruits complete the course, as a number of them typically drop out because of the physical and academic requirements. Hotz says the size of graduating recruit classes is normally 30-40. Outgoing Democratic Governor Jay Nixon gave the keynote address at Friday’s graduating class. 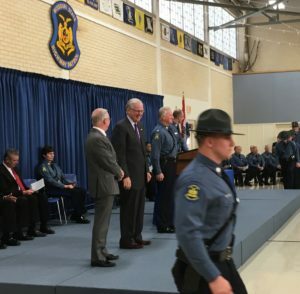 During the ceremony, he was given a trooper hat and an honorary plaque to recognize his attendance at every graduating class during his eight years in office. Nixon was presented with the hat and plaque by Highway Patrol Superintendent Colonel J. Ben Johnson, who is retiring after 30 years with the agency in February. At one point, Republican Governor-elect Eric Greitens was also slated to address the graduating troopers, but he was not listed on the commencement program and was not present at the ceremony.